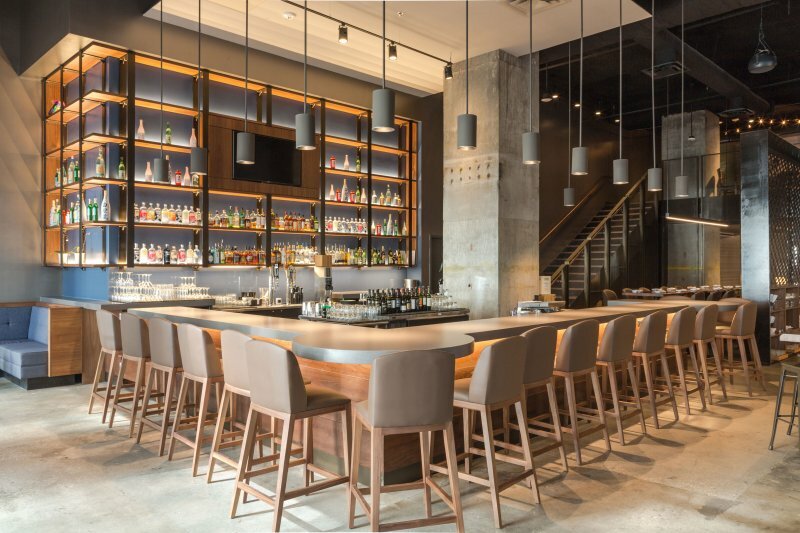 Located at the intersection of St. Charles Avenue and Poydras Street, Tsunami New Orleans is a $1.4 million renovation of a former conference center into a lighted jewel within a prominent corner of downtown New Orleans. The leased space was delivered to the client by the building owner as a “cold dark shell.” The previous space had covered the windows with heavy drapery and plantation shutters. 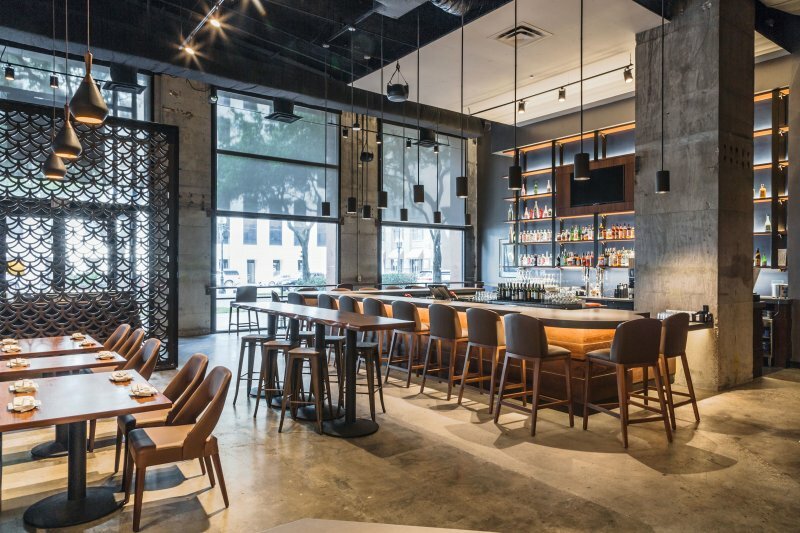 In redesigning the environment for an energetic, dynamic, and contemporary dining space, the first step involved removing these barriers. The team’s work in this regard was twofold: bring in natural light and create a visual beacon to draw customers in during the evening. The sushi bar was envisioned as a stage, meant to draw the eyes of diners to the action, as if they were an audience in a play. Woven throughout the space are natural earth tones, with warm woods and metals highlighted with hints of bronze. The concrete columns were left intentionally bare, as was the finished concrete floor. The bar surface is quartz, finished to resemble a concrete slab. 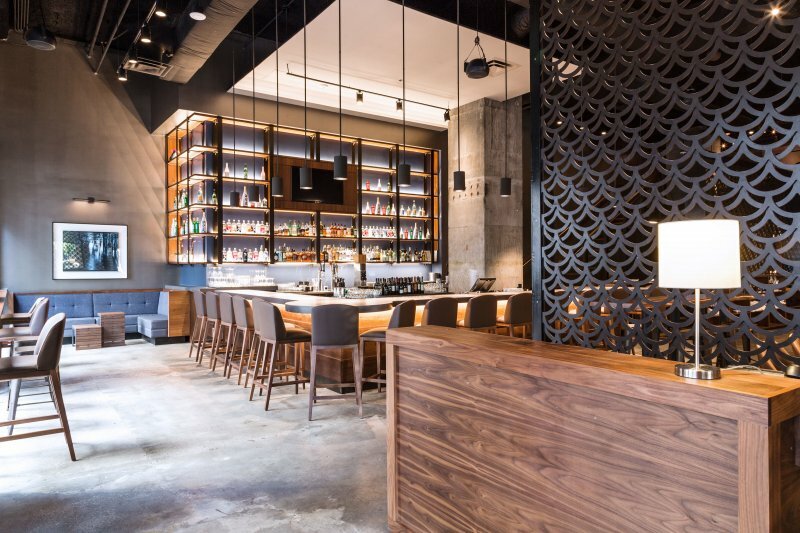 The sake bar was finished with custom shelving made up of steel bracing and wood plank. 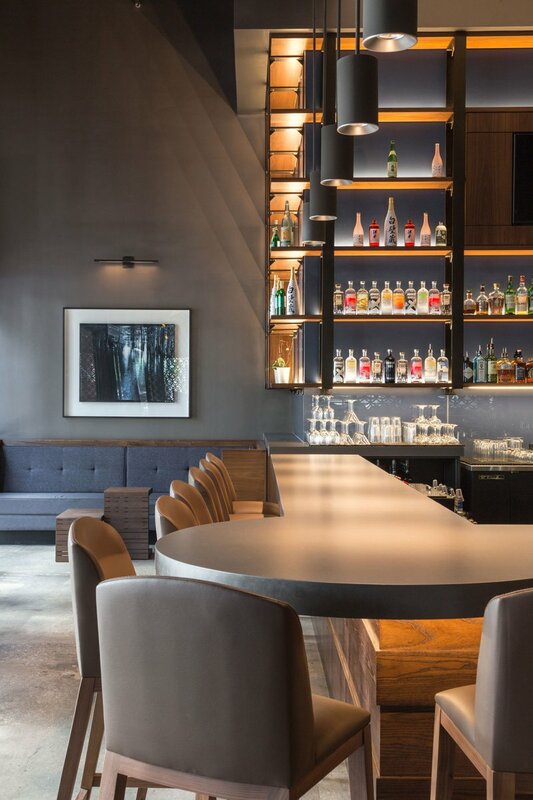 Through textured surfaces, subtle transitions between bar, group dining, and banquet seating, the team strived to create a delination of distinct zones throughout the space, all intended to enhance intimacy among diners. 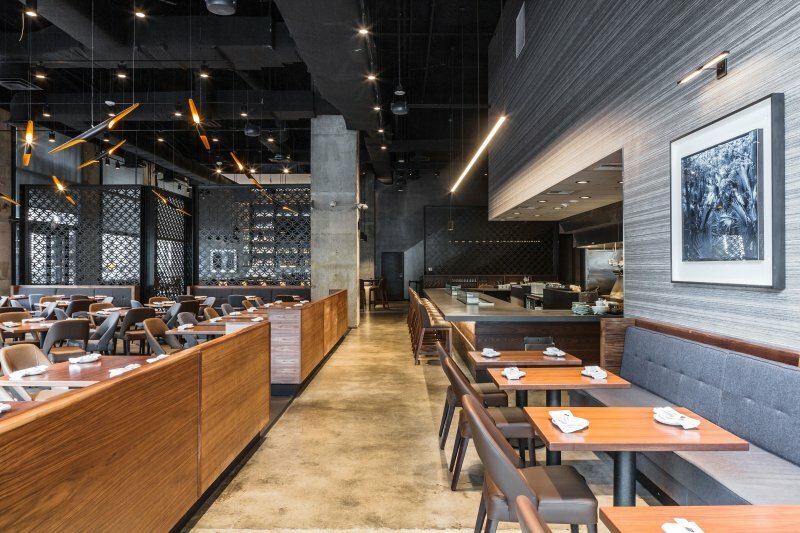 Inspiration was taken from Japanese Wagara patterns in creating screening elements and textured surfaces that lend intimacy to spaces in the restaurant, while maintaining visual connections between diner and sushi chef, restaurant patron and pedestrian. 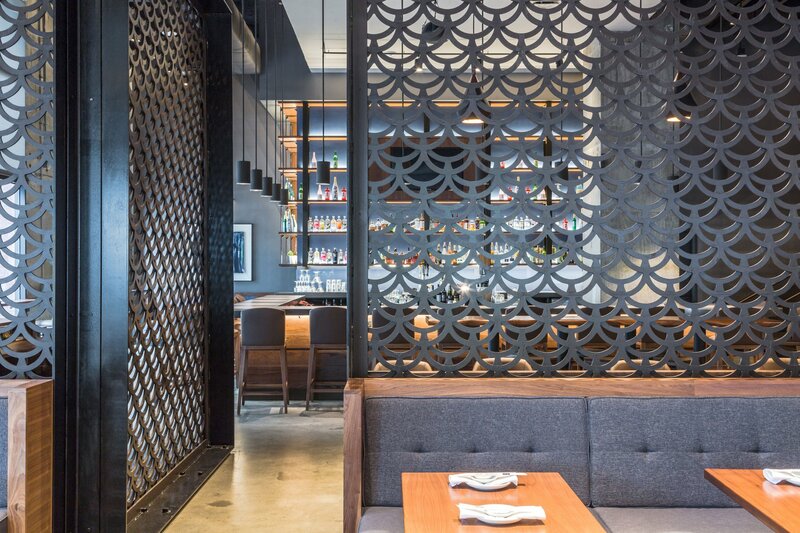 Wagara patterns are widely regarded as symbols of good luck and prosperity, and the textured surfaces add depth and variation to the different dining areas, affording varied experiences depending on seating location and time of day. The screening elements that frame the mezzanine stair, double as storage for wine and continue into the back bar to store liquor. Banquet seating elements are used to delineate circulation paths and dining areas, within which flexible 2- and 4-tops can be re-organized. The edges created by these fixed components, bring balance to the scale of the space while allowing visual access across the full restaurant.